Microsoft Xbox One - the streaming dream machine? In the growing relationship between Xbox One and Windows 10 we've found streaming a game full of compromise. With the launch of Windows 10 comes a greater synergy between the Microsoft operating system and its flagship Xbox One console. Part of that burgeoning console/PC love-in is the ability to stream your Xbox One games to play on any Windows 10 PC. That sounds like a funky new feature on the surface (pun only partially intended…) but how does it actually work in practice? We got down and dirty with an Xbox One console to see how well it can share its toys with its Windows 10-based siblings. Actually getting the streaming goods up and running is remarkably easy - especially if you've tried game-streaming on some other mediums before. I regularly use my (please don't be one of the overheating) Nvidia Shield tablets to stream games from my desktop PC. Good as that is it can sometimes be a struggle getting connected and even when it's at its most smooth you still have to go through an initial pairing process, entering handshake codes between the two machines. With the Xbox One/Windows 10 partnership though all you have to do is boot up the Xbox app on your Windows 10 PC and click on the Connect tab on the left hand side. As soon as you do this the software starts searching for any Xbox One console attached to the same network, whether wired or wireless. The only issue I found was one of my laptops, which had upgraded from the Technical Preview of Windows 10, was still running an older version of the Xbox application. That meant it didn't have the little Connect tab along the left hand side of the window. Check your version as it loads if you find a similar issue - 7.7.29027.00000 is the up to date app's designation. If you're running an older program simply nip into the Windows Store, select the Xbox app and it ought to start updating. The thing that surprised me about the streaming feature is that it's not just about the games. Once you're connected, and you tap the Stream button, the PC interface almost immediately disappears and the entire Xbox One dashboard fills the screen. Plug in an Xbox One controller and you're away. Essentially the hardware is encoding the entire Xbox One video output to stream to your PC. I found I could then control my Xbox One as though I was sat directly in front of it...with a few exceptions. That's in no way a deal-breaker - if you've got Netflix you can run it on your PC natively without worry - but it's interesting the OS is aware of the situation and is able to inform its applications too. So I'm plugged in, my Xbox One is connected to my PC and I'm whizzing around the dashboard with the trademark Xbox swooshing noise coming out of my PC's speakers. Now, to game. Because I'm a glutton for punishment - and my home network is pretty robust - I set the encode to High to give the optimum visual clarity. If you're finding things a little less than smooth you can drop to Medium or Low settings in the Xbox app. But this is where things get a little tricky. Not in terms of actually getting games running - they load up exactly as they would on the console proper - but more in terms of actually getting a pleasing experience out of them. My time streaming from my Xbox One to my PC has taught me that I'm going to have to be very picky over which titles I try and get gaming on my computer. Booting up launch title Ryse saw me hacking and slashing my way through barbarian hordes without problem. The images seemed clear, if a little flat over the stream, and with the network diagnostic info overlaid on top I could see my connections were solid. Moving on to a more fast-paced, timing-focused game like FIFA 15 things changed straight away. The li'l men on the pitch quickly become blurred, increasingly-pixelated versions of themselves, with a fair amount of jerk and noticeably dropped frames. In an arcade game like this suddenly the increased lag is far more obvious. It was there in Ryse, but as a single-player, non-timing-centric title it's not an issue. With FIFA it definitely was. Running both console and laptop in the same room I could hear a definite delay in the audio. With the console you're looking at around 150ms lag between controller, console and output, and in the time it takes to encode, send and decode the stream and you're at least doubling that to the point that it becomes noticeable in more speedy twitch-based games. Dropping the encoding settings and wiring in the Xbox, rather than going wireless, meant the stream was far smoother, but that did nothing to alleviate the lagging issues. To be fair to Microsoft this is nothing new. On every device I've tried game streaming with lag has most definitely been an issue with certain games. Single-player games which don't require millisecond timing thrive on a game stream. You could happily play through Batman: Arkham Knight and The Witcher III via a stream on your little laptop without worry. Try doing that with any fast-paced sporting or online shooty action - even with a solid network connection - and you'll quickly find yourself on a losing streak. This compromise is much more of an issue on the Xbox One than the PC, where the vast majority of time spent with lots of the consoles out there is going to be in the online arena. 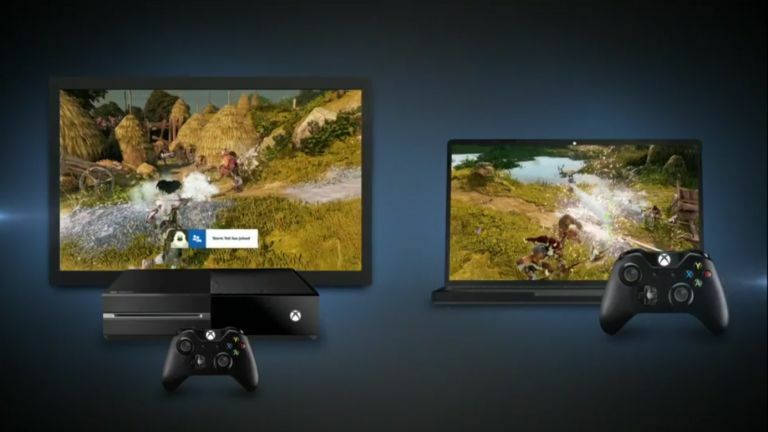 Microsoft has made an impressively simple way to stream content from your Xbox One to your PC. Of course if you've got a beefy gaming PC then that's not really something you'll be particularly interested in. But if you're looking for a little gaming on your basic Windows 10 laptop while the TV is being used for something else, then it's certainly got a place in your gaming armory. But you have to choose which games to play very carefully. It does though still smack of a beta test feature, something not quite finished. Microsoft has confirmed it is going to eventually turn the tables - once mouse and keyboard support is in the console - and allow you to stream from your PC to the Xbox One. It is though apparently a much trickier thing to enable than the other way around. So right now it's a one-way street. There's also the fact that as soon as you start a stream the entire Xbox One is being used. It's not like you can continue watching the TV service you've plumbed through your console while someone streams a game in the other room. With so much of the original hype surrounding Microsoft's flagship console being about the Xbox One becoming the centrepiece of your digital home, being able to run both TV and game streaming would surely be the goal. Right now then the console-to-PC streaming goodness is a neat little feature, but most definitely a niche little feature too. The Xbox One is no longer a games console.